I gots me a new car. Say goodbye to that 1991 Ford Tempo. 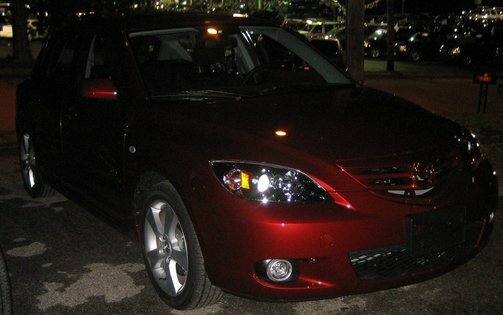 Say hello to my copper red 2006 5-door Mazda3s with moonroof and 6-CD changer. Let’s just say it’s teh hotness. I plan to take good care of this car and make it last for many many years. I also plan to give it the full geek treatment. It’s already got my Super Mario dice installed. Take note that this is the first car I have ever owned in my name. It is also the first brand new car I’ve ever had. It’s also the most awesome car I’ve ever had. And what’s with people telling me that the car is nice and thinking it’s a complement? That’s a compliment to the Japanese designers and manufacturers, not to me. If you want to complement me say something like “You’re smart for making such a good purchasing decision.” Actually don’t say that because I don’t care. This entry was posted in Personal and tagged cars, photos. Bookmark the permalink.